Smartphone manufacturers need to accommodate seven core smartphone applications, the “Big Seven”, in their next generation handset designs, according to In-Stat. These big seven applications include email, games, social networking, instant messaging, mapping & directions, music & radio, and weather. HiT Barcelona: Android Marketplace To Overtake Apple's App Store? INTERVIEW: Android’s Market will be at least as successful as Apple’s hugely popular App Store – and could prove even more of a hit. That’s the view of Florian Seiche, vice president of HTC Europe, who believes app downloads for the open-source software platform developed by Google could well emulate Apple’s success. 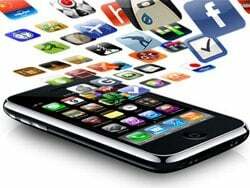 Mobile app revenues are expected to climb to more than USD $25bn by 2014 – fuelled by the launch of a raft of new application stores. But while one-off downloads currently account for the majority of revenues, that will change with the increasing utilization of in-app billing, according to Juniper Research. T-Mobile G1 customers have downloaded on average more than 40 applications from Android Market. With one million G1s sold that adds up to 40 million downloads in total since the first Android handset was launched six months ago.